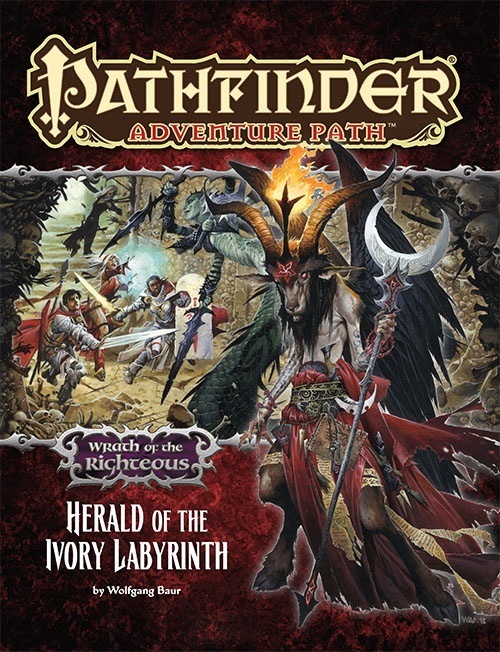 Our play-though of the Wrath of the Righteous Adventure Path continues as we head back to the Abyss in Herald of the Ivory Labyrinth. Third Session (6 page pdf) – We venture into the Ineluctable Prison in the Abyss to fight demodands and oozes. Then we are confronted with three cells, one with a demon, one with a devil, and one with a halfling… What to do? Fourth Session (8 page pdf) – It turns into Mazes & Minotaurs as we get closer to Baphomet. And we find a ball of twine that ends up being the best magic item ever. Plus a heart to unlock the next plot portion. This AP is… very video-gamey. Fifth Session (12 page pdf) – A brief vacation back to Drezen and then into the prison again. We beat up the two-headed marilith warden and go and convert a Runelord lich to the cause of good. Sixth Session (6 page pdf) – We go kill the prison’s torturer, turn a giant mythic linnorm to stone, and then go stick the heart back into the corrupted Herald of Iomedae. Grappling to the rescue!